NORTH CHARLESTON, S.C. – College of Charleston coach Earl Grant never doubted his team would cut down the nets at the Colonial Athletic Association championship and return to the NCAA Tournament for the first time in 19 years. “We didn’t realize we’d have that much adversity” on the way to the title, a smiling, relieved Grant said. Joe Chealey had 32 points as the top-seeded Cougars rallied from 17 points down in the second half to win the CAA title with an 83-76 overtime win against Northeastern. “Amazing grit by the players, amazing toughness, amazing belief,” he marveled. It certainly was an amazing comeback for a team that looked cooked early in the second half, down 42-25 with less than 18 minutes left and struggling to find any offensive rhythm. Yet an hour later, fans mobbed the Cougars at the North Charleston Coliseum in celebration. 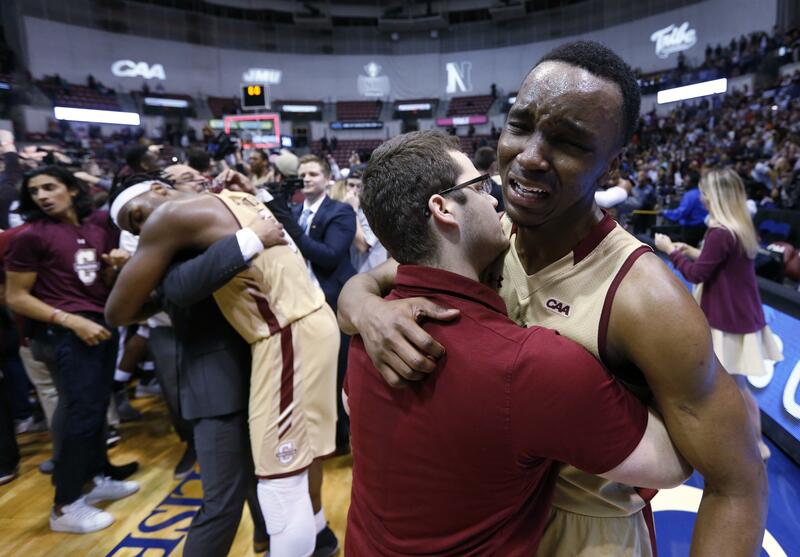 Now, it’s off to the NCAAs, where Charleston hasn’t been since 1999 when then-coach John Kresse built the Cougars into a yearly mid-major threat with four trips to the Big Dance from 1994-99. The school’s most successful run came in 1997 when it knocked off then-ACC power Maryland before falling to eventual champion Arizona. Grant believes his team might have another such run in them. After rallying to tie, the Cougars caught fire in the extra period. They hit their first four shots, including a pair of 3-pointers by Marquise Pointer to take a 75-69 lead. Northeastern (23-10) could not come back. The Cougars (26-7) appeared done early in the second half, trailing 42-25 after Vasa Pusica’s 3-pointer with 17:27 to go. That’s when Charleston ramped up the pressure – it forced 14 turnovers the second half – and tied it at 65-all on Chealey’s layup with 10.1 seconds to go. Charleston got the ball back with the chance to win in regulation, but Chealey’s long 3-pointer hit off the front of the rim. Jerrell Brantley gave the Cougars their first lead of the game, 67-65, in overtime before Pointer’s first 3 gave Charleston the lead for good. Two minutes later, Pointer did it again as the large, loud crowd at the North Charleston Coliseum exploded in delight. Northeastern’s last chance disappeared when Pusica lost the ball out of bounds on a drive with 40 seconds to go. “I can’t imagine a tougher” loss, Northeastern coach Bill Coen said. Pusica had 30 points to lead the Huskies, who saw their nine-game winning streak ended. Shawn Occeus added 19 points. Grant Riller scored 20 points for Charleston, 14 of those after halftime. Brantley finished with 18. Published: March 6, 2018, 8:52 p.m.